After working for a number of years behind the counter at an airsoft shop and heading up a CQB field, you make a lot of recommendations to enthusiasts on the equipment they are looking to purchase. Not a day goes by at either venue without an airsofter coming in looking for a pistol to either carry on the field or plink around their backyard. Elite Force’s line of pistols often commands attention at the shop and is a brand I’ve confidently recommended numerous times. 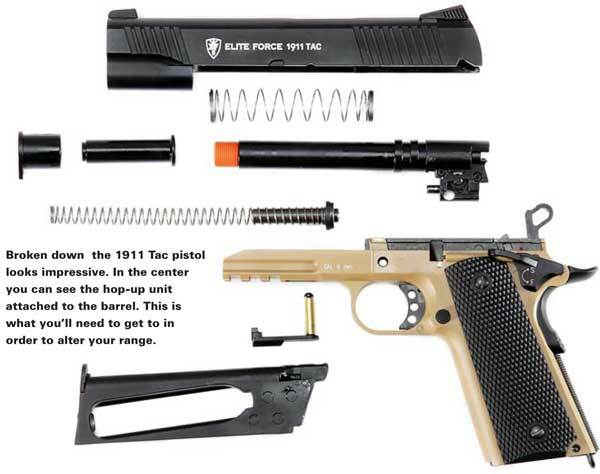 A relatively new addition to their offerings is the Elite Force 1911 Tac pistol. The Tac is a more modern take on the old 1911 frame, featuring welcome adjustments to the pistol’s design to make it a bit more user-friendly. A tan finish makes this gun more unique than others, but what really sets the Tac apart is the overall performance; so let’s get to it! The Elite Force 1911 Tac model has been updated with a nice two-tone tan finish on the lower frame and a black slide. Under this two-tone durable coating is a full metal gun so you can rest easy knowing durability will not be an issue. 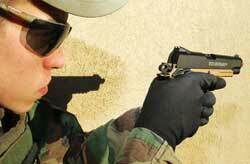 The Tac has all the same controls as the classic 1911; functioning slide catch, mag release and ambidextrous safety. It has also been given a new set of high visibility sights and a railed frame to accept tactical lights and lasers. The ability to have a 1911-style pistol with a light is great for indoor and night games. Having a threaded barrel for a mock suppressor is a nice touch, too. The hop-up on this gun works very well, giving you the added distance needed to shoot someone down range. The unfortunate part about it is the location. It requires you to take the slide off the frame in order to adjust rather than simply using an adjustment key. However it is still easy enough to just pull the slide back a bit and slide the catch out in order to separate the two pieces. The barrel on the gun is a standard brass 6.08mm smooth barrel that will offer consistent firing. A skeleton cut hammer and enhanced beaver tail safety finish it off. Plastic grips, a stippled back strap and a competition-like trigger give this pistol an excellent feel in just about anyone’s hands. The drop-free 14-round magazine loads up in a single stack look. The CO2 cartridge protrudes out to either side of the magazine but it can still fit in most pistol magazine pouches. Since the Tac runs on easy-to-find 12-gram CO2 cartridges, you don’t need to get green gas separately at a local or online retailer. The gun comes with the Allen wrench required to put the CO2 in and get the gun ready for action. So far the Elite Force 1911 Tac looks professional on the workbench, now let’s see how it performs in the field. First, newbies checking out this 1911 Tac need to know this is a single action pistol so you cannot take the pistol from the hip and simply pull the trigger. First the slide needs to be “racked” or pulled to the rear to allow one BB to enter the chamber. You will notice this also brings the hammer back and re-sets the trigger so it’s ready to fire. A double action pistol allows the user to simply pull the trigger in order to get the gun to operate. However the trigger pull is much further than the single and personally I prefer single action. When fielding the gun in the first round of testing I noticed the power both in the range and FPS of the pistol. The incredibly hard blow-back action was more than satisfying and the loud bang as the gun fired was pretty sweet, too. Using it in an enclosed environment was great. With the short trigger pull, getting a few shots off and dispatching my opponent to re-spawn was a breeze. Having space for my Tac light was great! It was easy to see in the darker areas of the field and to illuminate the BBs as I was firing to create a tracer-like affect. Being limited to only 14 rounds wasn’t so bad but an additional magazine for this pistol would have been nice so I highly recommend tacking another one on to your purchase. This gun is very gas efficient and being able to go through several mags without changing the CO2 cartridge was great. As playing progressed through the day, I really enjoyed using the gun. The CO2 ran very well and lasted for some time. The one downfall I did notice with using CO2 over green gas is that I couldn’t just top a mag off between games. Normally I put green gas in my other guns to just top them off. However with the CO2 cartridges I had to remove them and sometimes that meant wasting gas. However this gives you the peace of mind knowing that your pistol is fully loaded and ready to go. After a day of playing at our local indoor field I took it outdoors for some testing. Now I had the space to fire and test the range. The gun shot respectably considering the hop-up had not been adjusted. Luckily it’s pretty easy to adjust it. First, I took the magazine out from the gun and then I removed the slide-lock pin and took the slide off. This exposes the hop-up in the slide. I simply adjusted the dial a bit and reassembled it and fired a few rounds. It was right on the money! The gun fired great and the range was impressive. I enjoyed further testing and didn’t run into any issues. I can certainly see myself using the Elite Force 1911 Tac on the field often. The 1911 Tac CO2 blow-back pistol is a great performing weapon with classic roots. It’s a great full-metal pistol that fires hard right from the box with a crisp blow-back function. Shooting at a high FPS and with great trigger response, this CO2 blow-back pistol is a gun to be reckoned with. Since I’m engulfed in airsoft 24/7/365, I’ve had a lot of time with Elite Force’s offerings and I’m amped to be the one to put their 1911 Tac pistol through the testing paces for a few weeks at the field. This is one of the best performing CO2 blowback pistols I have used in a long time and it feels great to use. The weight and build give it a solid feel and the slightly unique styling makes this a great pistol for any variant of airsoft. Having a rail for a light and a threaded outer barrel for a suppressor are just icing on the cake!